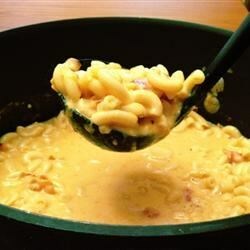 "A soup version of macaroni and cheese. Feel free to use the spices and flavorings that suit your family. We like peppery and warm seasonings, hence the chili pepper. This is a basic canvas that you can make all your own." Place the chopped bacon in a large, deep skillet, and cook over medium-high heat, turning occasionally, until evenly browned, 5 to 8 minutes. Drain the bacon on a paper towel-lined plate. Reserve 1 teaspoon of the bacon drippings. Fill a pot with lightly salted water and bring to a rolling boil over high heat. Once the water is boiling, stir in the macaroni, and return to a boil. Cook the pasta uncovered, stirring occasionally, until the pasta has cooked through, but is still firm to the bite, about 8 minutes. Drain well in a colander set in the sink. Heat reserved bacon drippings in a large saucepan over medium heat, and cook the onion until translucent, about 5 minutes; stir in the garlic, and cook until the garlic is softened, about 2 more minutes. Mix in bacon bits, chicken broth, cheese sauce, chicken bouillon granules, ground red chili pepper, black pepper, crushed red pepper flakes, and cooked macaroni. Bring to a boil and reduce heat to a simmer; cook, stirring occasionally, until the flavors have blended, about 5 minutes. Kids and adults LOVE this! Not bad, reminds me of hamburger helper.